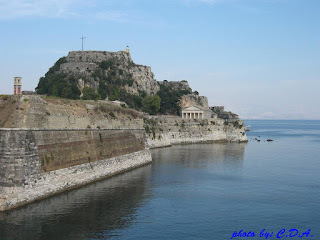 There is a lot to tell about the island of Corfu (Greek: Κέρκυρα/Kérkyra; Latin: Corcyra; Italian: Corfù) and for a summary go check Wikipedia. For me the island is one of the best places to spend you summer holiday. There's something special about the Greek islands: the people, the food, the history rich places and the combination of mountains and sea. Besides the great weather during summer (in winter life gets rather rough), one can enjoy water sports and the beauty of the mountains in a rather limited space (the islands aren't that large). I especially like the facts that you can't get lost that easily in the mountains of a small island and you can visit the entire place during a summer vacation. 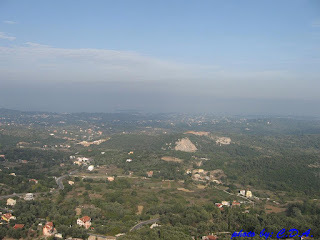 Regarding Corfu - it's simply great. Situated in the Ionian Sea, part of the Greek Ionian Islands, the island is very close to the western Greek shore and to Albania. It can also be reached by ferry from Italy. 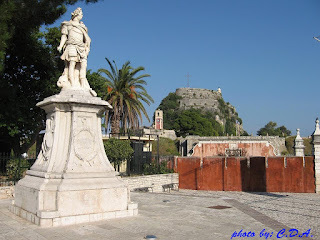 One can also get to Corfu by plane, since there is an international airport on the island, but for visiting freely the island a personal or rented car is a must. At least two weeks would be OK, but i only had one so i was always in a hurry during my stay. 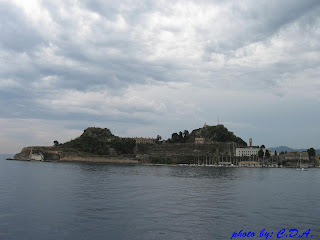 The island is believed to had been first inhabited by the ancient Phaeacians. 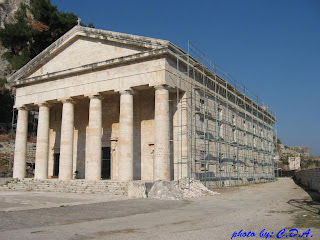 It had a part in many of the important events of the Hellenic period, proclaimed a free state during the roman conquest, occupied by the Genoese, later part of the Principality of Epirus. The island placed itself under the protection of Venice, which in 1401 acquired formal sovereignty over it, that's why many Italian influences can be seen nowadays. Because of the Venetian protection the island withstood the repreated attacks, mostly those of the Ottoman Empire until the 19th century. 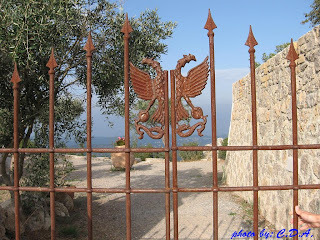 Situated in the middle of a conflict zone the island's control shifted between the French, Ottoman and finally British, until the Ionian islands joined Greece. During a couple of blogposts I'll try to highlight some places that shouldn't be missed while spending your time there (of course with personal photos :) ). If you have in mind anything I missed, please leave a comment. And if you're interested in the wild life of the island you can go here. 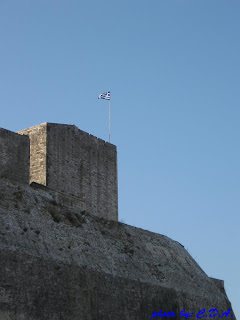 The Old Fort (Παλαιό Φρούριο) which was built between the VI-th & XIX-th centuries, with impressive architecture. 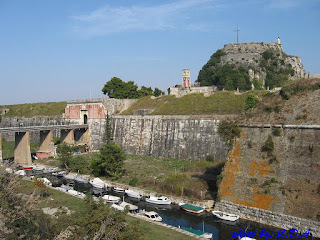 The Esplanade (Spianada) in front of the fort had a strategic position, so that the attackers were in open terrain when attacking the fortress. It is split in two parts: Upper square (Ano Plateia/Ανω Πλατεί) and Lower square (Kato Plateia/Κάτω Πλατεία). 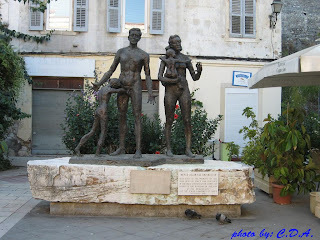 Liston (Λιστόν) is a group of buildings built between 1807 and 1814 hosting nowadays offices, restaurants and residences. 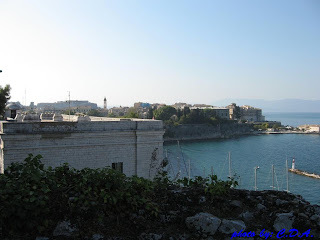 Anaktora - St. Michael and George Palace was build during the British occupation around 1819 and it is an unique monument of Georgian style in the Mediterranean, located at the north part of west Spianada. Part of the building hosts the Museum of Asian Art (It was founded as a Chinese and Japanese Art museum in 1927 after the donation of 10.500 items by Gregorios Manos and starting with 1974 it became an Asian Art museum). 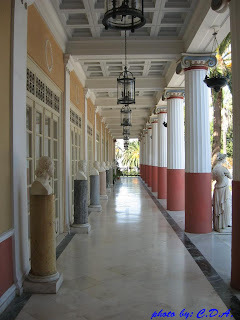 The Archaeological Museum of Corfu has a collection consisting of findings from the ancient city of Kerkyra, the Kerkyrian Kassiopi, and also of excavations of Thesprotia. 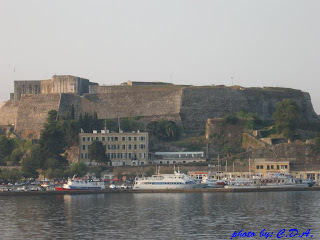 The New Fortress (Neo Frourio/Νέο Φρούριο) or Fortress of Saint Mark built on the elevation of St. Mark in the XVI-th century by the Venetians. 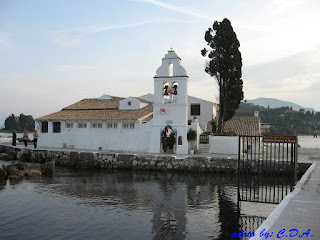 Saint Spyridon Church (Ἃγιος Σπυρίδων) hosts The Holy Relic of St. Spyridon, the patron and loved guardian of the island of Corfu. 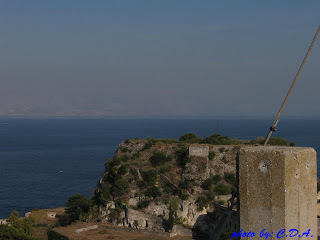 Mon-Repos is situated over the the ancient city of Palaeopolis, founded the 6th century B.C. There are findings of Doric temples dedicated to Poseidon and Hera, ruins of the ancient agora and early christian basilica. 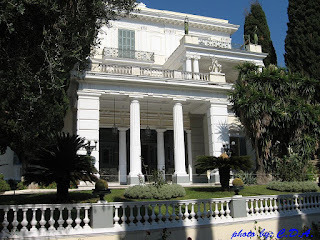 The palace Mon-Repos, build at 1831 from Commissioner Adams for his wife, today is changed in a museum. 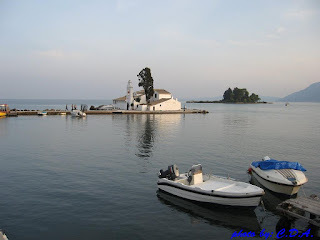 2) Mouse Island (Ποντικονήσι/Pontikonisi) and Vlacherna Monastery (Μονή της Παναγιάς των Βλαχερνών) - basically part of Corfu town, at the southern part of the Kanoni peninsula that can also be reached from the main road across the Halkiopoulos lagoon. 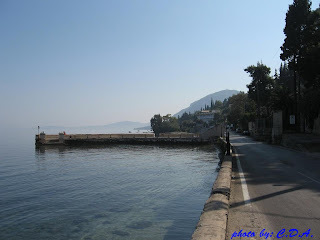 There's a narrow crossing so that on foot or by bike one can easily reach the town. This is one of the most photographed places in Corfu, and a very good place to see the planes because it's right next to the airport runway. Surrounded by trees, in the middle of Mouse Island (its name comes from the mouse-tail-like shape of the stairs seen from above), is the ancient Byzantine monastery of Pantokrator (Bυζαντινή εκκλησία του Παντοκράτορα), dating back to the XII-th century. 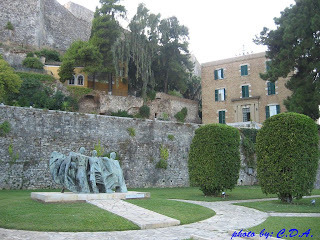 For much more info and some nice pictures check out digitalCorfu and Travel-To-Corfu. 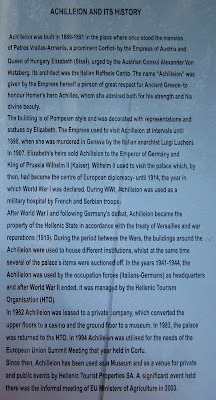 3) Achilleion (Αχίλλειο or Αχίλλειον) - situated in the region of Gastouri (Γαστούρι), is an impressive palace built around the theme of Achilles(Ἀχιλλεύς) by Empress Sisi of Austria on the place of a mansion bought from Petros Vrailas Armenis. 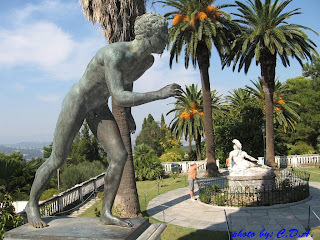 The palace was designed by Italian architect Raffaele Caritto while Ernst Herter, a famous German sculptor, was commissioned to create works inspired from Greek mythology. 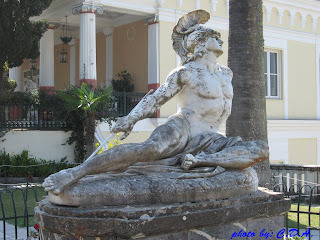 His famous sculpture Dying Achilles (Ancient Greek: Αχιλλεύς θνήσκων), created in Berlin in 1884 as inscribed in the statue, forms the centerpiece of the Achilleion Garden. The statue is in accordance with the tragic life of Empress Elisabeth of Bavaria (Sisi), and in contrast with the other sculpture of triumphant Achilles made by Johannes Götz and commissioned by German Kaiser Wilhelm II. The palace is nowadays a museum with a collection of historical objects, paintings and sculptures, but it can also host certain special events. For more info check the picture below and a virtual tour can be found here, while you can also visit Wikipedia. 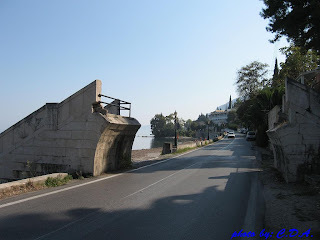 4) Kaiser's Bridge (η γέφυρα του Κάιζερ) - is a bridge built by German Kaiser Wilhelm II. 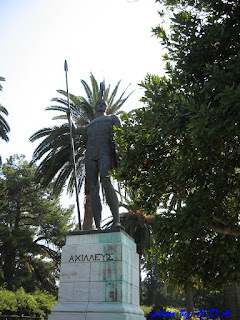 He purchased the Achilleion in 1907 after Sisi's death and built the bridge to access the beach without traversing the road forming the island's main artery to the south. The bridge's central section was demolished during the German occupation of World War II to allow for the free movement of its vehicles. Its remnants can be seen from the main road. There isn't much space to park a car though. 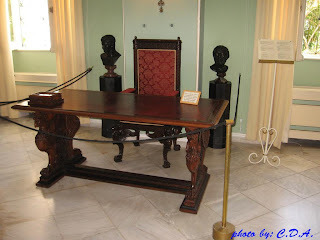 5) Kaiser's Throne (Ο θρόνος του Κάιζερ) - on the other side of the island (western coast), above the village of Pelekas (Πέλεκας) and 12km from Corfu Town, there's a lookout point made by Kaiser Wilhelm II and names such Kaiser's Throne. On a clear day one can have a splendid view of the entire island from here (not to mention magnificent sunrises/sunsets).